Much of the polar bear research in Canada and American Arctic in the 1970s-1980s was funded by oil and gas companies, because it was the right thing to do (and governments required it). Now, Greenpeace says providing such money is just oil company marketing, meant to make them look good. Stirling et al. 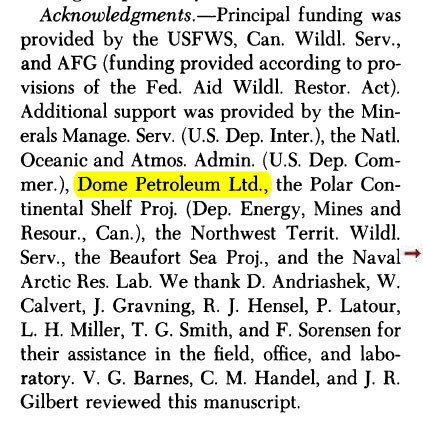 1993, oil funding acknowledgement for work in the Eastern Beaufort Sea. 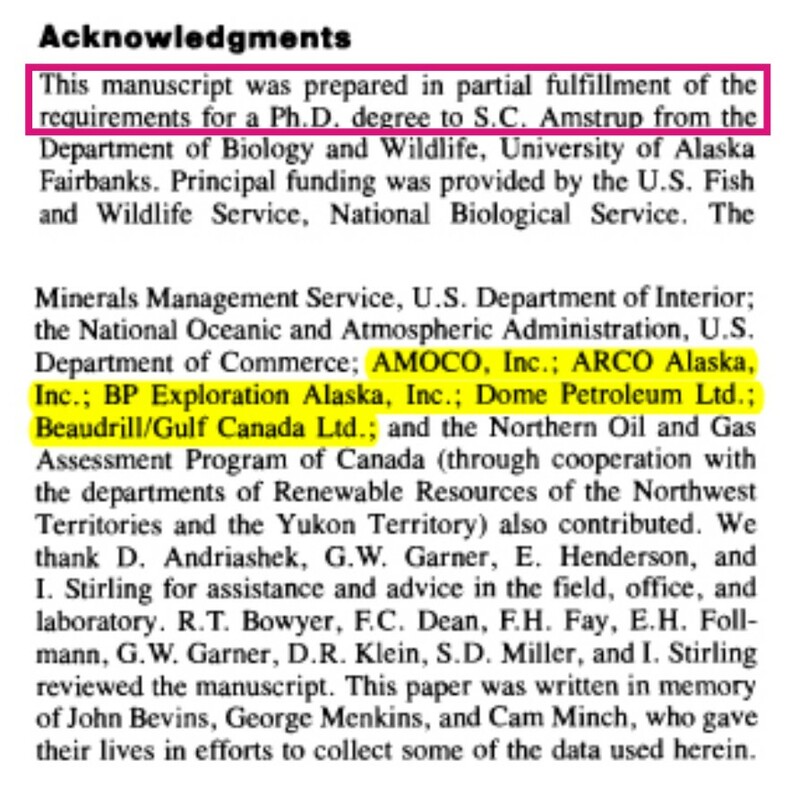 Oil money helped fund the Ph.D. research of polar bear biologist and Polar Bears International spokesperson Steven Amstrup (Amstrup and Durner 1995), and made possible a number of other critical research projects in the early days of polar bear research that might not have been possible otherwise (Stirling et al. 1993; Stirling and Lunn 1997). 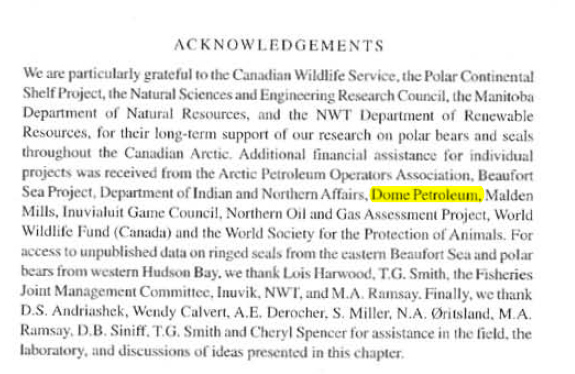 Have a look at the media reports and the oil funding acknowledgements from polar bear research papers (“References”) and see what you think. Courtesy IUCN Polar Bear Specialist Group. “Big-oil backed Arctic researchers are advertising for a hardy soul to work for them as a polar bear spotter in Siberia, in a move panned by environmental campaigners as an attempt at ‘greenwash’. The Arctic Research and Design Center for Offshore Developments wants somebody to count the numbers of polar bears in the 20 to 25 different groups living around the ice-bound Kara Sea. 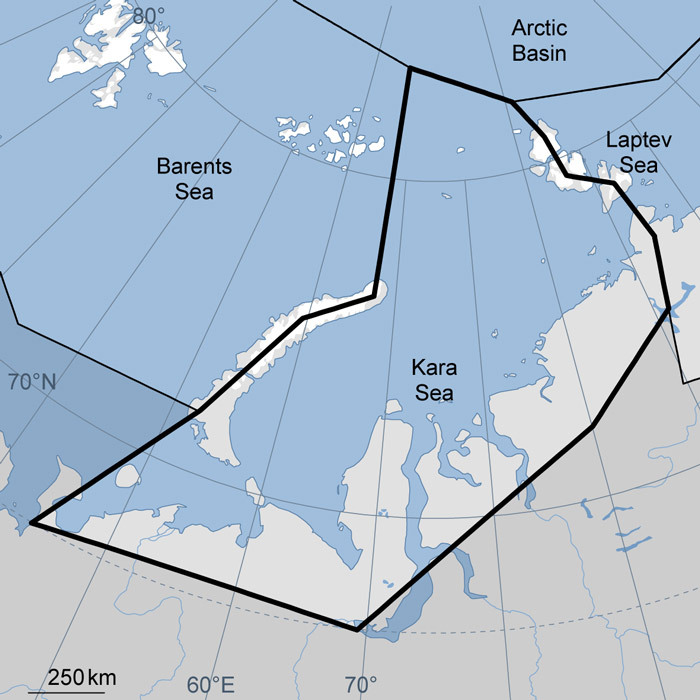 The project is a joint venture between Russian state-owned oil company Rosneft and ExxonMobil, the American multinational oil and gas corporation, to exploit fossil fuels locked beneath the Arctic ice. For now, their research is concentrating around the sea off Siberia’s frozen north-west coast. Well north of the Arctic Circle, it is covered by more than a metre of ice for most of the year. The job advertised by Rosneft and ExxonMobil is part of a $3.2billion exploration programme to work out how best to exploit the Arctic’s natural resources. As well as counting bears, the person who wins the post will also be expected to place electronic monitoring collars on up to 20 adult females. They also need to take blood samples from the bears so that laboratory tests can be carried out later. But only the brave and resilient need apply. Polar bears are one of the few mammals that will deliberately hunt humans for food. Good eyesight is a must to spot the white bears against the icy background. Winter temperatures in the area plunge to minus 46˚С. But although it includes working with animals for a species officially classified as ‘vulnerable’, the work may not suit conservationists. Other versions of the same story here and here. Amstrup, S.C. and Durner, G.M. 1995. Survival rates of radio-collared female polar bears and their dependent young. Canadian Journal of Zoology 73:1312-1322. Amstrup, S. C., I. Stirling, and J. W. Lentfer. 1986. Past and present status of polar bears in Alaska. Wildlife Society Bulletin 14(3):241-254. Stirling and Lunn 1997. Oil funding acknowledgement. This entry was posted in Advocacy, History and tagged activists, Amstrup, Arctic oil, Beaufort Sea, environmentalists, funding from oil companies, funding sources, Greenpeace, oil money, polar bear, polar bear research, Rosneft, Stirling. Bookmark the permalink.